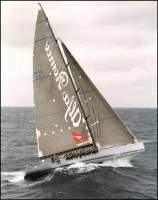 The Sydney to Hobart blue water Yacht race has attracted interest from all over the world for almost 60 years. This is arguably the premier event on the Australian Yacht racing calender. The race attracts various vessels from 30-footers to 90-footers, sailed by crews who range from your weekend club sailors to professionals who have competed in major ocean going races. The race covers 630 nautical miles and begins at 1300h in Sydney Harbor on Boxing Day and finishes after a sprint up the Derwent River around 1300h on Friday December 31st in Hobart. Quite a few people have been landing here on the mate looking to track the competition using our vessel tracker - but alas - none of the vessels are participants in the system so I have little to offer you. But I figured base on the number of searchers I should at least post a bit of info here to make your trip worth while.